Arizona State University and Starbucks announced April 6 that the Starbucks College Achievement Plan, first introduced in June 2014, will now offer 100 percent tuition coverage for every eligible U.S. Starbucks partner (employee). "Everyone deserves a chance at the American dream," said Howard Schultz, chairman and CEO of Starbucks. "The unfortunate reality is that too many Americans can no longer afford a college degree, particularly disadvantaged young people, and others are saddled with burdensome education debt. By giving our partners access to four years of full tuition coverage, we will provide them a critical tool for lifelong opportunity. We're stronger as a nation when everyone is afforded a pathway to success." As part of its commitment to redefine the role and responsibility of a public company, Starbucks developed this program in partnership with ASU to create additional pathways to opportunity for its workers. Nearly 2,000 Starbucks partners have already enrolled in the program. This significant expansion will offer a top-notch education to all full-time and part-time Starbucks partners, with the opportunity to choose from 49 undergraduate degree programs through ASU Online. The company will invest up to $250 million or more to help at least 25,000 partners graduate by 2025. 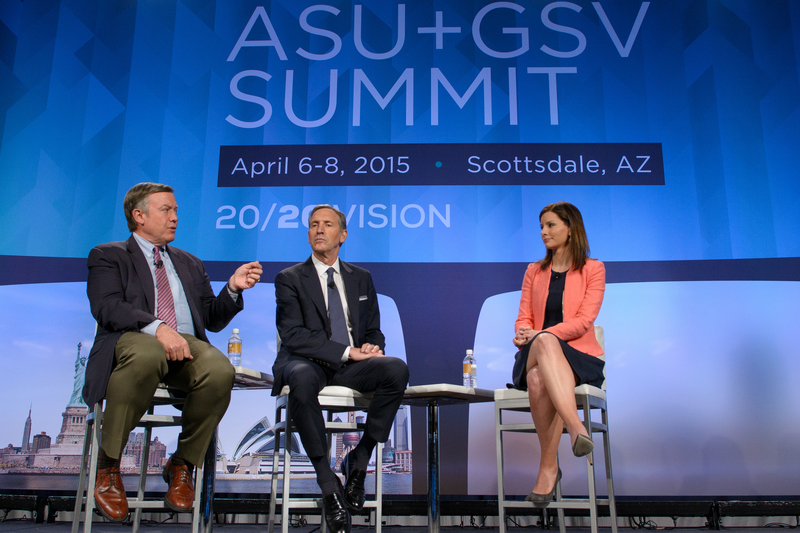 United States Secretary of Education Arne Duncan looks to this innovative model from Starbucks and ASU as an example for other industries and businesses. There is a clear and demonstrated value of having a college degree, both the opportunity it affords and the measureable impact on earning potential throughout a lifetime. The disparity between what U.S. college and high school graduates earn has more than doubled in the past 30 years. A typical bachelor's degree recipient can expect to earn 66 percent more (compared with a high school graduate) over a 40-year career. College education is crucial to getting a middle-class job – Millennials with only a high school degree are more than three times as likely to be unemployed as those with a college degree. ASU's online degree programs offer the highest quality and most flexibility, ensuring the best chances for success in achieving a degree. Each course is fully designed to make the most of online learning, and ASU’s highly engaged faculty are retrained for effective online teaching. ASU is a leader in employing innovative educational technology to deliver tailored academic support. It also invests in the student support services that are critical to reducing drop-out rates, and is ranked first in student services by US News & World Report. The diplomas ASU awards to online students are identical to their on-campus degrees, and their session-to-session student retention rates and graduation rates are extremely strong. 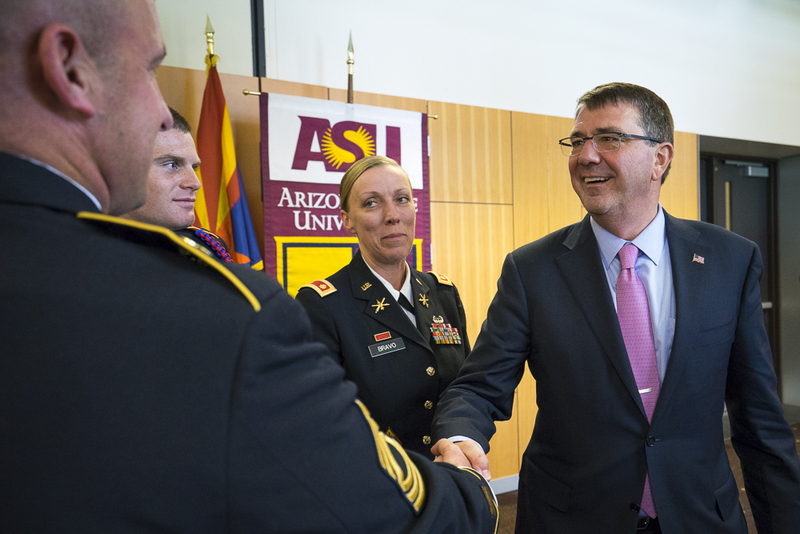 United States Secretary of Defense Ashton Carter addressed about 250 Arizona State University students, staff, faculty and local military personnel at the Memorial Union on the Tempe campus on April 6. Half of all humanity and a majority of the word’s middle class will reside in the Asia Pacific in the next few decades, which is why the United States is bolstering its efforts to protect the region with as much military might as it can muster. Carter addressed about 400 Arizona State University students, staff, faculty and local military personnel at the Memorial Union on the Tempe campus on April 6. ASU’s McCain Institute hosted Carter before his first official trip to Asia as head of the Department of Defense and asked him to speak on the links between economic and national security in the Asia Pacific. Carter said thanks to McCain, the U.S. and Vietnam have overcome years of mistrust and have forged a military relationship of shared defense capabilities, something that was not possible a decade ago. Carter pointed to Vietnam as an example of the United States' relationship with the Asia Pacific on the eve of what Carter terms a “rebalance” to ensure we do not lose ground in this dynamic region. A big portion of the rebalance includes a big show of military force and construction of military bases and installations in Japan, Korea and Guam. To accomplish this mission, Carter said the U.S. will deploy several weapons, technologies and a realignment of troops to the region. They include a long-range stealth bomber; a new long-range anti-cruise missile; F-22, P-8, B-2 and B-52 aircrafts; the creation of a “Star Wars”-style railgun, which uses electromagnetic forces rather than explosives to fire rounds; and a couple of Aegis Ballistic Missile Defense ships. ASU freshman Ray Riebli, who is planning a career in the Marines, said he found Carter’s remarks about the Asia Pacific exciting and well-executed. ASU serves more than 4,500 military, veteran and dependent population students and is committed to their success in education. The university has been named a “Military Friendly School” by G.I. Jobs magazine six years in a row. An earlier version of this story said about 250 people attended the event.